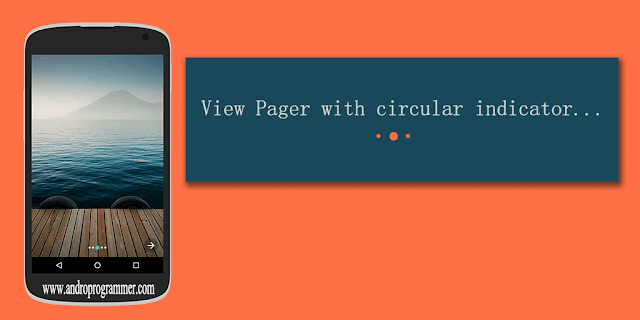 There are number of libraries available to create circular indicator for view pager. But i think you don't require that all heavy weight libraries. They all filled with so much congested and non used code in it. It may happen you may come across some odd issue with those libs. So to save your time and even with easy to understand code i have written this tutorial. Go through full tutorial and you find how easy it is. I have created View pager for introduction of the application (Current trend of application start screen almost in all Google apps). But you can use it as per your requirement. Create activity (welcome screen) which holds pager to display images and give proper name to it. In this tutorial it is ViewPagerDemo Activity. now put below code inside into xml file (layout file). For View pager, layout part is done. you can find sample images from here. now let's move to code part where i have created circular dots on the basis of data size. So if you have let say 10 images it will create 10 dots with first one as selected by default. put the code in to activity and make changes as per your project implementation. // To make activity full screen. * Created by Wasim on 11-06-2015.